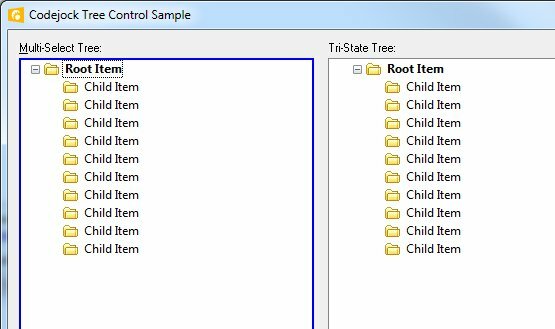 After migrating to version 16.1 of Toolkit Pro, tree controls based on CXTPTreeCtrl don't show any lines, even if the TVS_HASLINES and TVS_LINESATROOT are set in the resource or the derived class. I see this behavior in my app, and also, for example, in the CodeJock Tree Control Sample. Sometimes, when clicking in the tree where the [+] icon usually is, the [+] icon shows up, but the next tree redraw hides them again. Lines are never shown. and the [+] and [-] icons and the tree lines are back!!! Has anything changed with the way we need to initialize tree controls in 16.1? Some new 'Theme' method we must call or anything to make this work. Since this also fails in your samples, can you please have a look. We need to ship our product and we need to decide whether or not be ship XTP 16 or the older version. Hello, this has been fixed for the next release. Sorry guys, tested a few minutes ago with latest 16.2.0, the problem is still present. Only calling CXTPTreeBase::DoPaint with bInternal == FALSE shows the lines. Your code does not handle TVS_HASLINES or TVS_LINESATROOT. Either handle and draw it or call the default window procedure. I'll try to get a solution for me comparing to the sources of 15.3.1 until this problem is fixed within a future release of the toolkit. I compared source code for version 15.3.1 and 16.2.0.